Welcome to Busy Bee Holiday Party Ideas! 4th of July, Halloween and Thanksgiving. 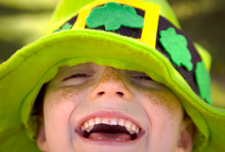 St. Patrick's Day is just around the corner and you'll find tons of fun St Patrick's Day Party Ideas right here. Start it off right by sending out unique FREE printable invitations and impress your guests with fun St Patrick's Day party games and activities. Top it off with yummy green food and fun party crafts! You will find lots of ideas to make your party unique and memorable! This Easter make party planning easy with our fun Easter Party Ideas. Use our ideas to make your own invitations, or send out some adorable FREE printable invitations and check out our fun Easter party decorating ideas for your home or classroom. We make planning Easter party games and activities easy, including some really unique Easter Egg Hunt Ideas! 4th of July is a special time for friends and family, make it even more special with these 4th of July Party Ideas. We've got some really fun ideas for party invitations and unique decorations. Plan your activities by age with our fun Fourth of July Party Games and activities section, and serve some tasty patriotic food. We've got tons of great ideas that will make this years festivities the BEST!